Caption slip reads: "Photographer: Rustan. Date: 07-18. Reporter: Petty. Assignment: Mother slayer. 41: Don F. Stewart, neighbor who called cps. 81-42: Sgt. James N. Hamilton with body of Mrs. Underwood. 39-40: Copy of victim, Mrs. Hazel Underwood. 35-36: Sheriff's Sgt. Claude Everley [sic] holding bolo knife and cloth it had been wrapped in. 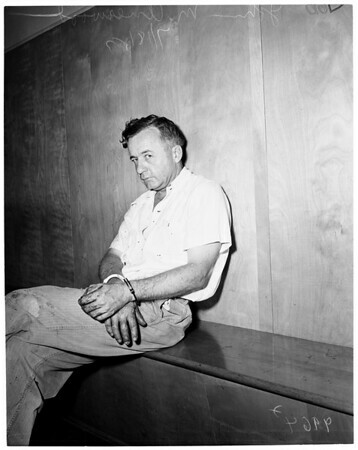 65-66: Slayer John M. Underwood at Norwalk substation with blood on hands."